Okay, I'm not sure how gazelle intense we are at this point, but I do know that I'm getting truly mad at our debt. Mad about our lack of progress. Mad about how it's holding us back from starting a family. Mad about how it's trapping me in jobs I despise. Mad about still paying Navient for a degree I can't use. Debt is slavery. It really is. The only thing I really care about in 2018 is getting rid of as much debt as we can. I'm going to turn 29 in a couple of weeks, and I'm tired of squandering my good days working my tail off to pay for stupid decisions I made years ago. So yeah. I'm getting mad, and I'm getting fired up about tackling this thing in 2018. I spent some time playing around in Excel to create new debt snowball tracker sheets for the year. I made enough to track for 12 months. As you can see, they're simple. 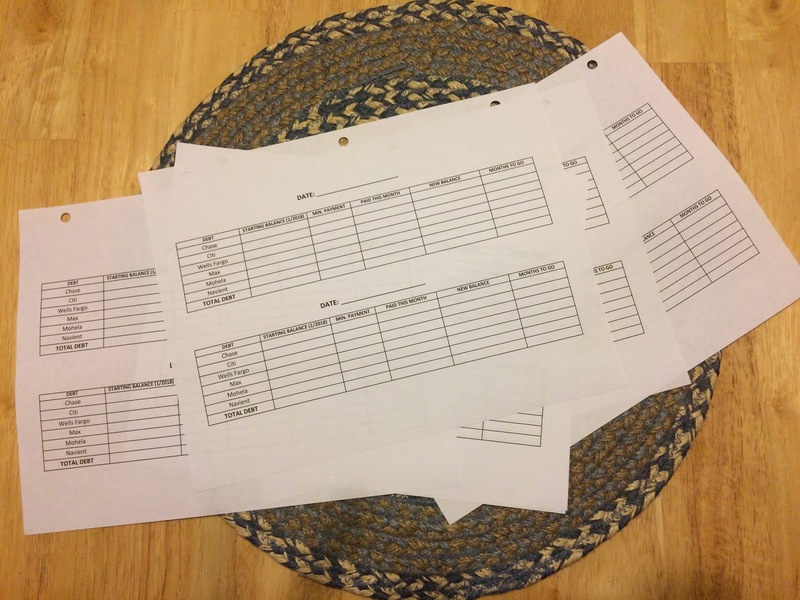 An even more consolidated version of my old snowball tracker sheets. You might notice that there's a new starting balance date: January 2018. I'm done comparing our current balances to where we were when we first discovered Dave Ramsey back in 2015. I'm DONE. No more comparisons that end up getting me all mopey about moving backward and junk. No. 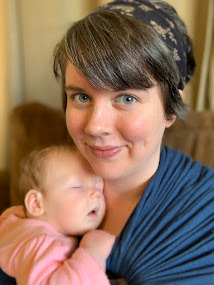 As soon as our $1000 emergency fund is replenished this month, we restart Baby Step Two, and I'm wiping the slate clean. Another change you might catch is that there is no longer "Matt Navient" and "Jen Navient" on the list. It is now simply "Navient." I've recently discovered that viewing his student loan debt and my student loan debt only creates division and, admittedly, resentment. So no more his and hers when it comes to student loans. We both owe money to Navient for our four-year degrees, and we're married to each other. It's our Navient debt. One lump sum. And what an overwhelmingly large lump sum it is. So large, in fact, that I'm honestly considering breaking Baby Step 2 down into Baby Step 2A and 2B. 2A: Consumer Debt, 2B: Student Loans. Seeing how our Navient and Mohela balances only increase each month as we pay minimum payments is sickening, discouraging, frustrating, and infuriating, and we don't need to worry about that right now. 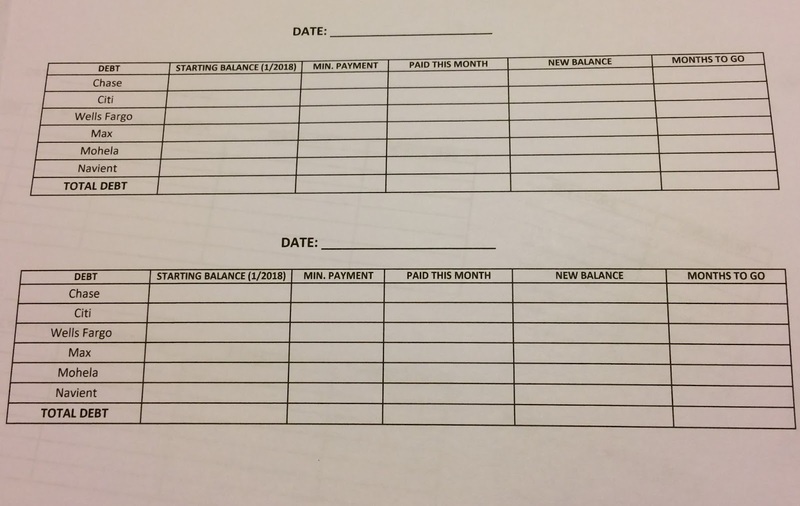 I still want to keep running totals on our sheet, but with this in mind, I created a second snowball tracker specifically for Baby Step 2A. I got this amazing planner for Christmas. 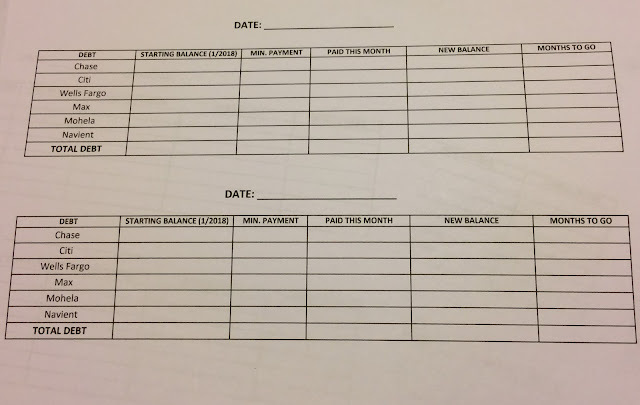 It contains monthly and weekly calendars, of course, but in the back, it also has to-do lists, not-to-do lists, a bucket list, a budget tracker, and graph paper for bullet journaling. Every time we put $100 toward debt, I'll fill in a square. I'm excited. It should be almost as fun as the little paper chains I used to make as a kid to countdown to Christmas. In related news, I'm going to try a No-Spend Challenge this month. It's gonna be somewhat sad considering it's my birthday month, because this means 1) no dining out, 2) no coffee shops, 3) no new-to-me clothes, 4) no decorative knickknacks, 5) no anything that is not groceries, fuel, or medical necessity. The plan is to allocate all the money we would have normally budgeted into these cash categories straight to the Chase card for our first snowball payment. I received a total of $247 in cash for Christmas (The random $7 came from an envelope game we played at my in-laws). Matt also received $250ish, but what he does with his Christmas gift money is his own business. Personally, I'm struggling to decide how much of my Christmas money I should set aside for my own use and how much I want to send straight to Chase. Part of me is sooo stinking mad at our debt and soooooooo anxious to be free from these shackles and start living life that I want to give it all to Chase immediately. But another part is going, you haven't had a haircut in months and your socks have holes in them. And yet another part says, just treat yo' self, you deserve it, YOLO. I'm not 100% sure how I'll break it down yet, but I do know that the greatest fraction will be going to Chase. 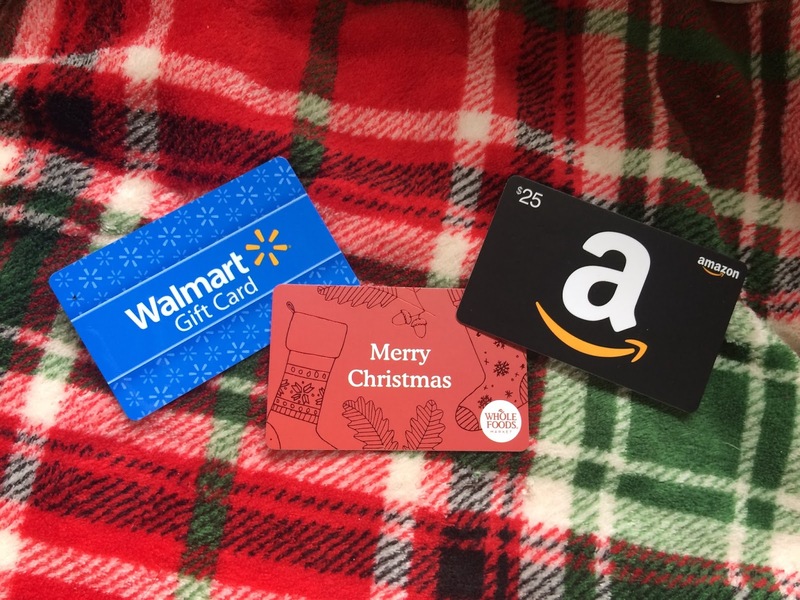 My employer gifted me a $10 Walmart gift card; a bit insulting, but still appreciated (and better than the cellophane bag of peppermints I got at the nursing home in Missouri). I received a $25 Amazon card from my in-laws and a $15 Whole Foods card from Matt. We also returned several unwanted Christmas gifts with labels indicating they came from Walmart and received $27 in Walmart credit (they'll take pretty much anything back without a receipt, and we needed money for groceries more than we needed stuff). The plan for this month involves taking our $37 in Walmart credit to get groceries from there (though I successfully avoided shopping at Walmart for an entire year last year). Between the Walmart gift cards and the plentiful Walmart Ibotta rebates, we should really stretch our grocery budget and help our No-Spend Month. I'm going to hang on to my Amazon and Whole Foods cards while I think of things I'm needing the most. I know I want to do a lot of outdoor work and gardening this spring, so I might get some gardening boots on Amazon. Not sure yet. The point is, I'm trying to be very intentional with my purchases. I am just so ready to get on this. 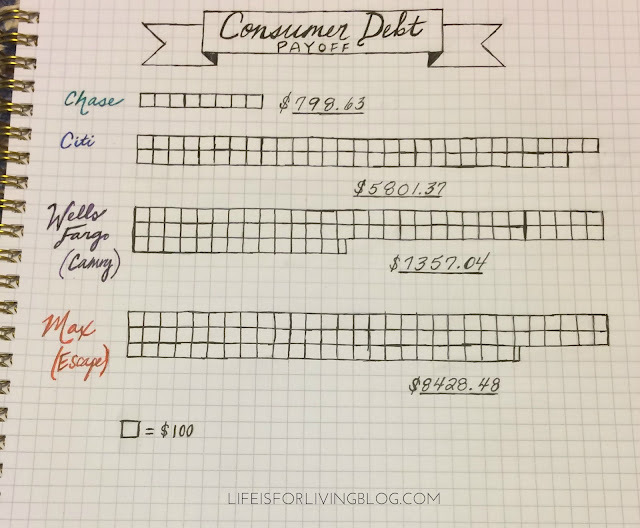 I did some calculating and determined that we could have our credit cards paid off by August if we could scrounge up at least $800 extra each month. That's a lot of money, but we usually have an extra $500 or $600 monthly that somehow disappears (disappears to restaurants). But Murphy aside, $800 shouldn't be too much of a stretch. Picking up side jobs, working extra shifts, selling things. I have to stop myself from thinking, What Christmas gifts can I sell? Next year, cash and Aldi gift cards only, pleeeeeease. 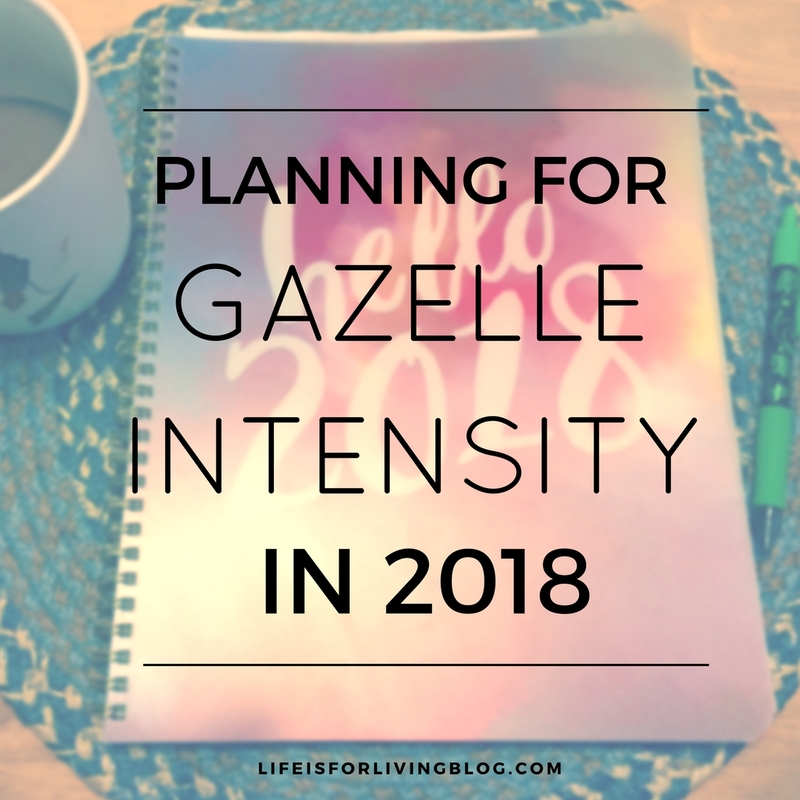 I litteraly just finished our updated Gazelle intense budget that we are starting this week! I want to say thank you for sharing your experience! I swear you were reading my mind as you wrote this! Our goal was to be out of debt by May and then we slowed down and too much money has been disappearing for our creature comforts as well. I will be praying for you guys! Thank you for the boost of encouragement! I can't wait to read more of your blog! I just started reading your blog (and binged like a year's worth in one sitting, because your writing style is really wonderful. You really should follow that dream of becoming an author). I'm the same age as you and finishing a second degree this year. 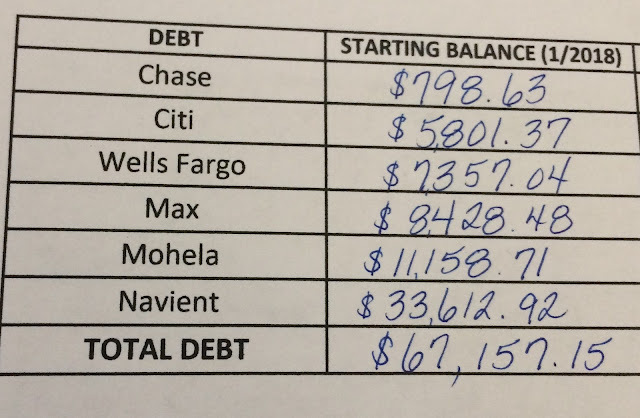 My boyfriend and I are CAD $135,000 in debt. I just want you to know that you're not alone in this. I also feel like I should reach out a little here and try to give some advice, even though it may not translate perfectly from the Canadian context. And I apologize if this is super rudimentary and you're already doing all these things. 1. I understand the David Ramsay snowball plan- paying off the lowest balance first. Does he also advocate though for paying off the loan with the highest interest rate first? That would save you the most money in the long run. 2. Do you have an option to refinance that student loan? Because holy crap, that is a high interest rate. OMG if my interest rate was 9% I would drown in this debt. 3. 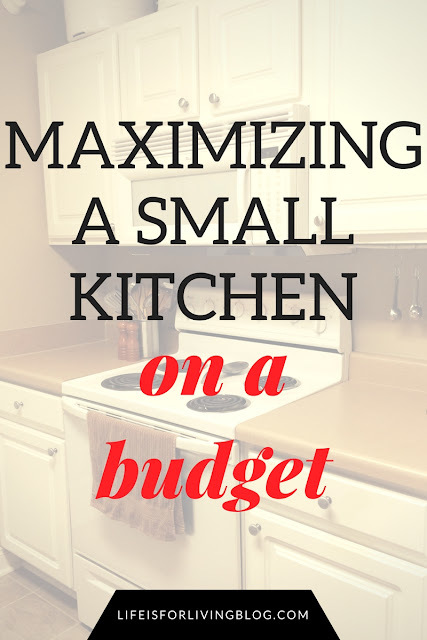 We save a ton of money on our grocery bill just by doing 3 things: cutting our snacks down to nil (because they don't make us feel full and are really just a waste of money), eating meat only 3 times a week, and making HUGE batch cooking and freezing. Our instantpot is our best friend. Also, hey, we feel healthier! 4. Could you afford a financial adviser? I have one, and he really is very helpful.